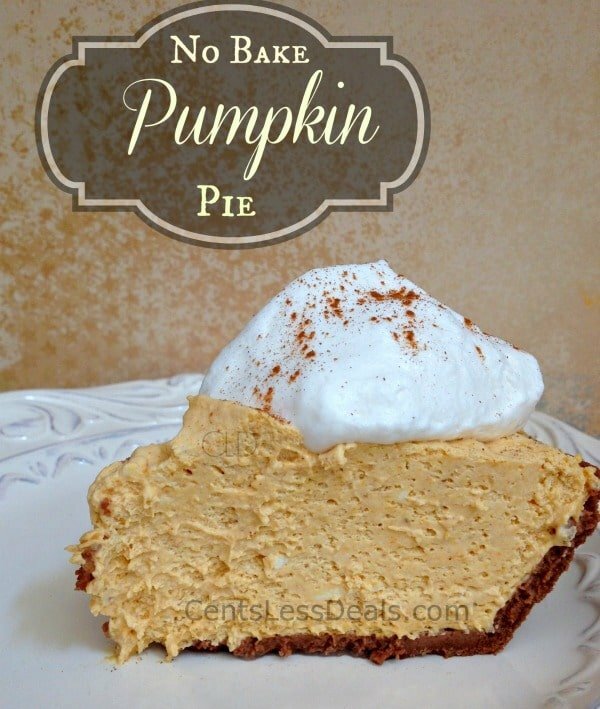 This easy no No Bake Cream Cheese Pumpkin Pie is a family favorite and the best part is how easy it is to make! No need to turn on the oven and since this is best made ahead of time, it’s the perfect ending to a busy meal! Pumpkin pie is pretty much a given at any fall meal and of course at thanksgiving! There’s a good reason it’s a classic dessert that has been topping off fall meals for years. It’s rich and creamy with a delicious pumpkin flavor and an unmistakable spice. While a traditional pumpkin pie isn’t that hard to make, it can take a lot of time to bake and cool. It also ties up precious time in the oven during a busy turkey dinner meal when my oven is pretty much full from the time the sun starts shining! This easy version requires no baking and is best made a day ahead of time making it the perfect turkey day dessert! 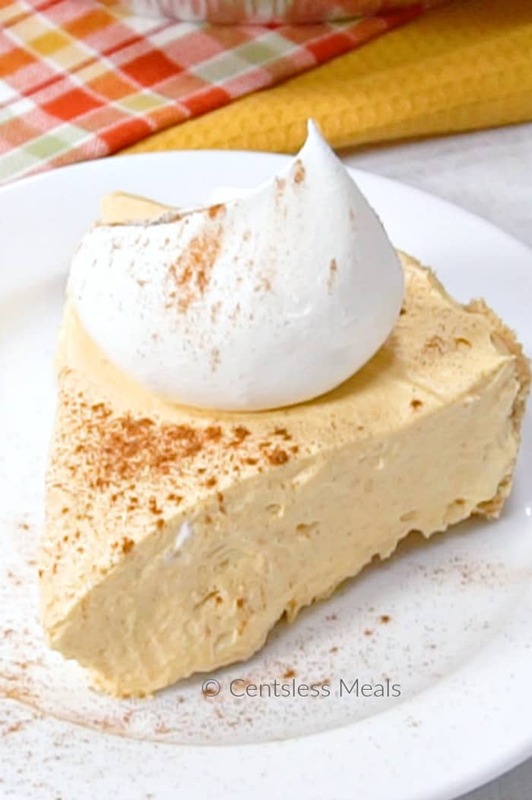 Adding cream cheese to the mixture adds richness while the pumpkin and warm fall spices bring a familiar flavor to this no bake pie. Simply mix the ingredients together for a light and fluffy version of a classic pumpkin pie that everyone will love! 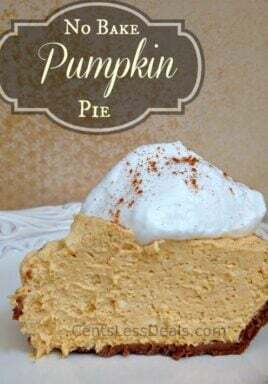 My favorite things about this recipe are that it can be made well ahead of time making it the perfect no fuss Thanksgiving dessert and that it’s a bit lighter in texture than a traditional pumpkin pie but still has huge flavor! To make this extra quick and easy, I use a pre-made graham crust. If you’d like to make your own crust, it’s super easy! In a medium bowl combine 1 1/2 cups graham cracker crumbs, 6 tablespoons melted butter and 1/3 cup white sugar. Press into a 9″ pie plate and refrigerate at least 30 minutes before filling. Either way, this No Bake Cream Cheese Pumpkin Pie is going to become a fall favorite since it’s so easy to make and and gets rave reviews every time! This easy pumpkin pie version requires no baking and is best made a day ahead of time making it the perfect turkey day dessert! In a medium mixing bowl, whip the cream cheese until fluffy. Add pumpkin pie filling and cinnamon. Mix until well combined. Fold in whipped topping and spread into prepared pie crust. 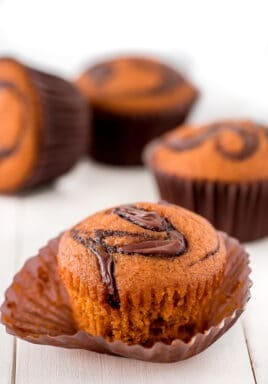 I made this recipe with pumpkin puree and pumpkin pie spice, cinnamon and 1/2 cup of sugar. It turned out amazingly. 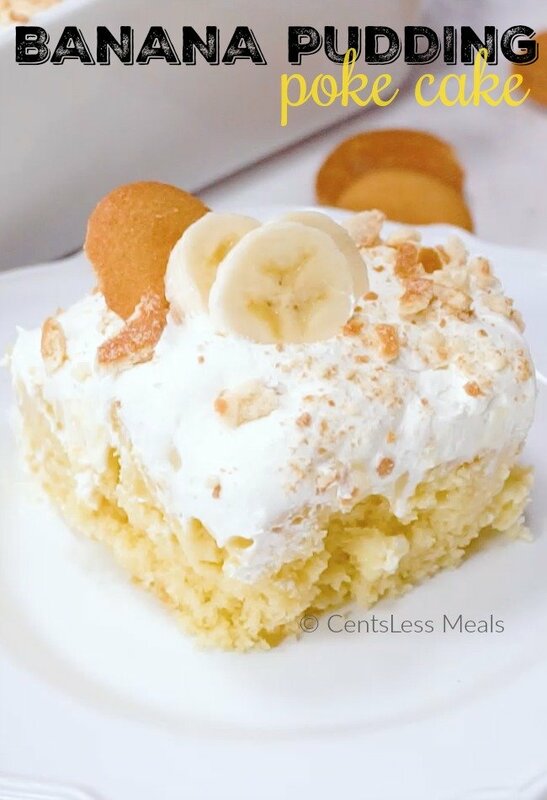 Thank you for this no bake recipe!! You’re welcome Alicia! Thank you for sharing and I’m so glad you loved it! This didn’t even begin to set up; it was more like a pudding. Tasty, but I’d prefer something a bit more pie like. I’m sorry it didn’t turn out for you Laura. It’s an alternative to traditional pumpkin pie, for sure! Jeez…. People really can’t read huh???? I used the ingredients listed and it came out AHHHMAZING! love no bake deserts. Thank you for sharing your recipe! Glad you enjoyed it Alisa! Saw no bake pumpkin pie recipe on facebook,can’t wait to try it! I’ve only tried the recipe as written. If you wanted to substitute whipping cream, I’d suggest adding some powdered sugar to it as you are whipping it. Let us know how it turns out for you! pumpkin pie filling? not solid pack pumpkin? Yes Linda, pumpkin pie filling. Enjoy! Hi: Just the recipe I was looking for-thanks! I haven’t tried the recipe yet but I give it a 4 star anyway for it sounds so easy and good! So, just to get this straight. Am I supposed to use the pumpkin pie MIX in the can or the canned pumpkin? The mix has sweetness and spiced already in it, and the canned pure pumpkin does not…correct? My husband refuses to eat anything made with cool whip. Is there an alternative? Would highly suggest using pumpkin purée and adding condensed milk into the mixture. 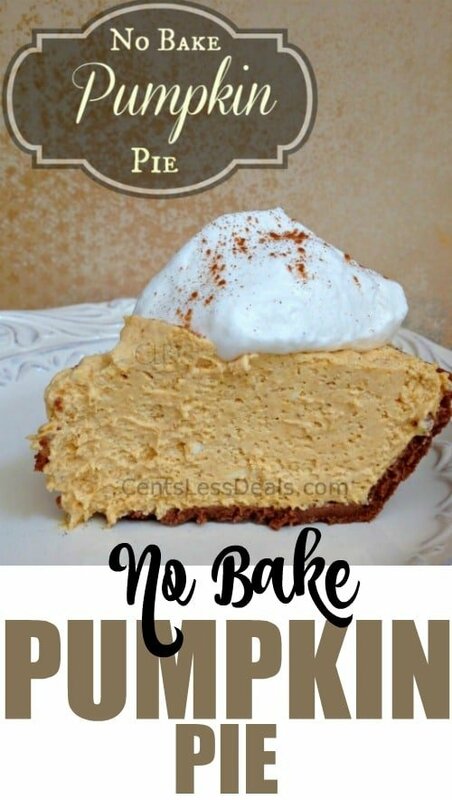 I made a no bake pumpkin cheesecake dessert with a similar recipe but it used condensed milk too, made it very sweet and yummy. This was fantastic! A real hit at the Thanksgiving table this year! 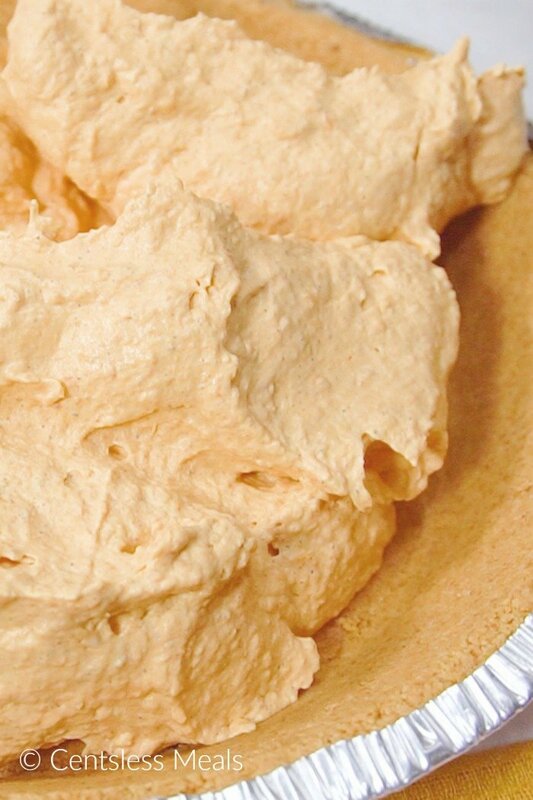 Pam G – I was thinking of trying this with gingersnap crust instead of graham-cracker crust. I’m going to try about 2 cups broken-up gingersnaps and 4 T melted butter, and will add more butter if it doesn’t seem moist enough. I am not crazy about graham cracker crusts. Think it would be ok in a baked pie crust? Tasha, why are you following the recipe on the can? 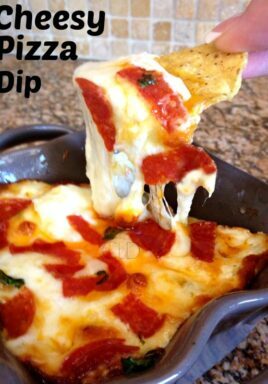 Follow the recipe on this page! That’s what it is here for. I can’t imagine a real grocery store that doesn’t carry pumpkin pie filling. I’ve lived in small towns all my life and I’ve never seen a grocery store that doesn’t carry it. Those of you who shop at stores that don’t carry pumpkin pie filling – find a better store, for goodness sake. Could this be made with pureed sweet potatoes? I’m thinking it could if I baked the sweet potatoes instead of boiling them. I too made the mistake of buying pumpkin puree. I had to add a lot of seasoning Nd a bit of sugar and it still was very bland. If you add eggs, you will need to bake it. Pumpkin puree comes in a 15 oz can….as requested in this recipe. I’m familiar with pumpkin pie filling, but have only seen it in a larger can than 15 oz. That may be causing some of the confusion. Just wondering how much cool whip. I’ve only seen 1 size. Where do I buy the pumkin filling? I went to the grocery store and told them I needed pumkin feeling not just pumkin in a can and they had no clue what I was talking about. Don’t stress if you bought canned pumpkin accidentally like I did. Just add the following to the canned pumpkin to create pumpkin pie filling. Can you freeze the pie if i was to make a double batch? Do you have to add the evaporated milk and eggs as stated on the can or do you use it as it is straight out of the can? Mine made more than I could fit in the pie crust. The remainder is really good refrigerated, then served as a dip with ginger snap cookies. Good recipe!! VERY Easy and delicious it was a hit! My grandsons help me make this today. You don’t use pumpkin purée you use pumpkin pie filling. It has sweetener and spices in the pie filling. Add the cinnamon as called for. The pie is not thin because of the cream cheese. It is very good. We took some and used as a dip with graham crackers. Yum…. 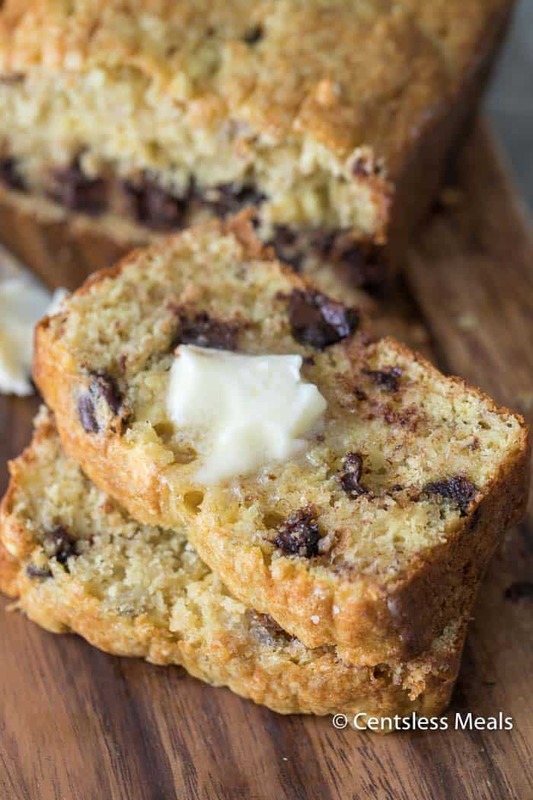 This recipe is a keeper especially a 5 and 7 yr old can make it! I just made this I tasted it before I put it in the fridge. It was so bitter! I used a can of Pumpkin! I added some sugar and it helped some. Hope the whole pie doesn’t get tossed! I wonder about the pumpkin too. I mistakenly used a can of pumpkin–not pie filling–and it was terrible. Not sweet at all. My guests couldn’t even pretend to like it. One guest told me it was because pie filling would be sweeter. I think you mean a 15oz can of pureed pumpkin, not pumpkin pie filling, correct? The mixture would be awefully thin! 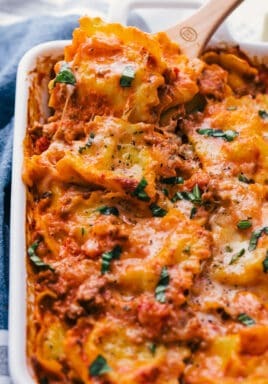 Love this easy recipe, perfect for fall. This would be so easy to make too!